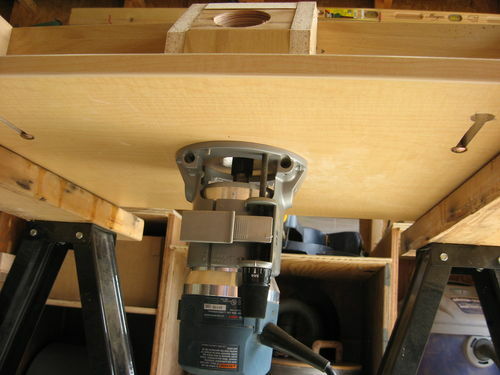 I’ve been wanting to get my new router table built for a while. I could have used it on almost every project I have been working on. 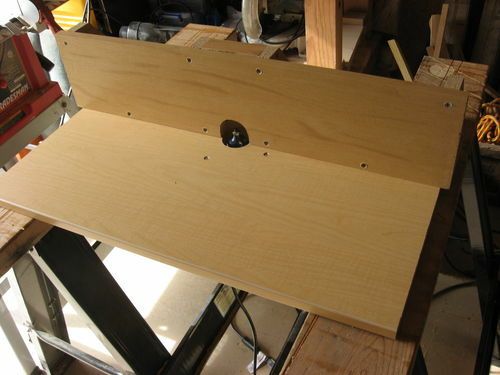 It was just time to replace my old skil router and table. I got a router lift for my Bosch router from my in-laws for Christmas. So today I squared up a piece of laminated particle board that I had gotten from work for free. Then I cut a few pieces of laminated particle board I had laying around the shop to make a fence. I still need to get a router base plate but until I have the extra money I just mounted the lift right to the particle board with some longer screws I picked up at the hardware store. 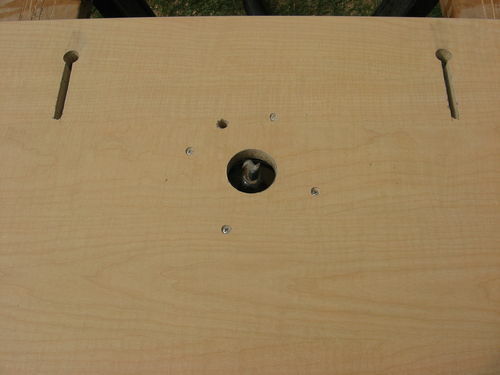 So I predrilled holes for the mounting screws and also for the T-handle for adjusting the router height. I made the fence so that it could be reversible between a short fence and a longer one, but I’ll probably only use the longer side that is in the pictures. 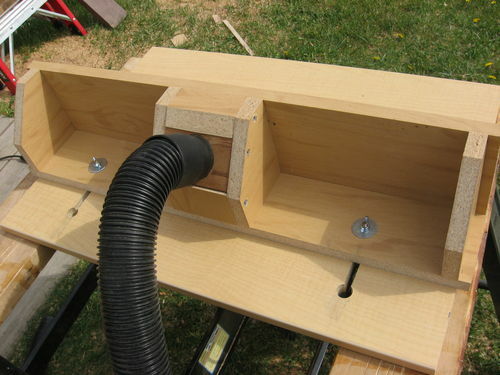 I closed in around the bit opening and drilled a 2 1/4 inch hole for my dust separator to attach. I drilled holes for the ends of 1/4 inch carriage bolts to fit through and cut slots for the bolts to slide in to adjust the fence in and out. Making it this way all I have to do to remove the fence is loosen the wing nuts and slide the fence the whole way back and lift the whole thing up off the table. The whole thing is usable now setting on trussel benches, but eventually I’m gonna build a closed in stand for it to be mounted to. I also have T-track that I will attach to the fence for feather boards and stops. 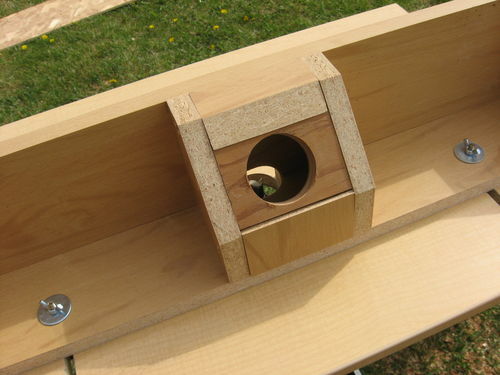 I’ll probably also install a threaded insert so I can add a small shaft for freehand routing. I have a 2 inch opening that works for most of the bits I’ll be using for now, and hopefully I’ll have my router base plate by the time I need a larger opening. Still shopping around for the best router base plate at a good price any suggestions would be appreciated. one question. What are you going to do to the laminate to make material slide easy over the surfaces? It looks good to me. I would just wax the top if it’s a problem. -- I can explain it to you, but I can't understand it for you. I'm sorry,thanks. The laminate is actually pretty slippery, which is why I used it over plywood. Other than that wax is always an option to keep it that way.